Julia Fiona Roberts (born October 28, 1967) is an American actress. She became a Hollywood star after headlining the romantic comedy Pretty Woman (1990), which grossed $464 million worldwide. After receiving Golden Globe Awards and Academy Award nominations for Steel Magnolias (1989) and Pretty Woman, she won the Academy Award for Best Actress in for her performance in Erin Brockovich (2000). Her films My Best Friend's Wedding (1997), Mystic Pizza (1988), Notting Hill (1999), Runaway Bride (1999), Valentine's Day (2010), The Pelican Brief (1993), Ocean's Eleven (2001) and Twelve (2004) have collectively brought box office receipts of over $2.4 billion, making her one of the most successful actors in terms of box office receipts. Roberts had become one of the highest-paid actresses in the world, topping the Hollywood Reporter's annual "power list" of top-earning female stars from 2005 to 2006. Her fee for 1990's Pretty Woman was $300,000; in 2003, she was paid an unprecedented $25 million for her role in Mona Lisa Smile (2003). As of 2010, Roberts's net worth was estimated to be $140 million.Roberts has been named one of People magazine's "50 Most Beautiful People in the World" eleven times, tied with Halle Berry. In 2001, Ladies Home Journal ranked her as the 11th most powerful woman in America, ahead of then national security advisor Condoleezza Rice and former first lady Laura Bush. Roberts has a production company called Red Om Films. Maksim Aleksandrovich Chmerkovskiy (born January 17, 1980) is a Latin Ballroom dance champion, choreographer, and instructor. He is best known as one of the professional dancers on the American television series Dancing With The Stars, on which he first appeared in season two. 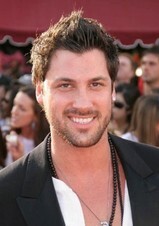 Maksim's previous DWTSGame partners include: Ana Beatriz Barros, Kelly Holmes, Lanisha Cole, Cher (runners-up), Julia Roberts (winners), Katherine Heigl (finalists), Kristen Wiig, Nelly Furtado (quarter-finalists), and Jennifer Lopez (quarter-finalists).